We love ordering shrimp fried rice when we order take out from our favorite Chinese restaurant. I wanted to make it healthier since I know how salty and bad for you fried rice can be. This was a fairly quick and easy recipe and would be good for a weeknight when you’re pulled every which way. In a small bowl, whisk the eggs. Heat a nonstick skillet coated with cooking spray over medium heat. Add eggs; cook and stir until set. Remove from skillet and keep warm in a small bowl. In the same skillet, saute onion in the oil until tender. Add garlic and cook for an additional minute. 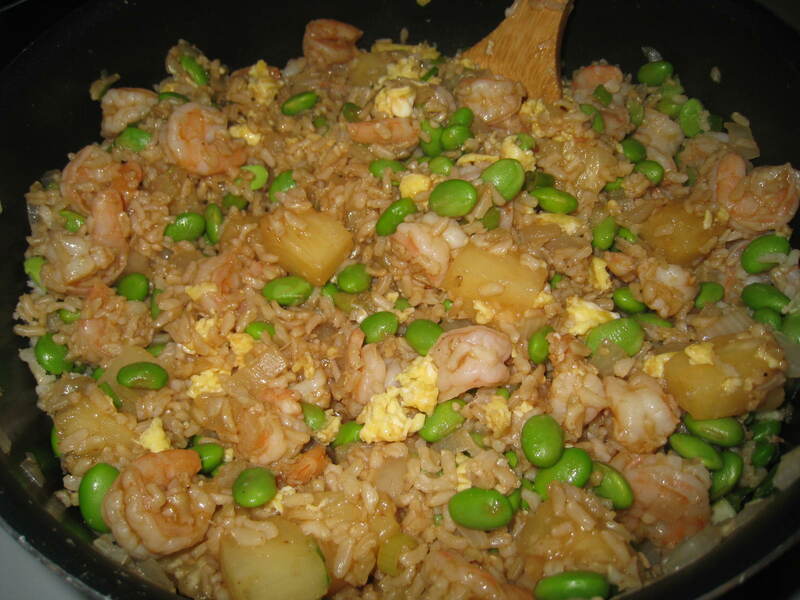 Stir in the rice, pineapple, shrimp, edamame, and green onions. Heat throughly. In a small bowl, combine the soy sauce, hoisin sauce, sugar, sesame oil and pepper. Stir into the rice mixture and add eggs.